Now that we're halfway through our first year of Ambleside Online, I am sharing some of our thoughts on the individual years and books. 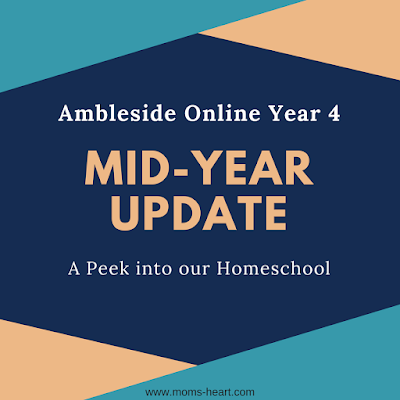 I shared our Mid-Year Update for Year 2 recently, and now I'm sharing Elliott's experience with Ambleside Online Year 4 so far. A little backstory: he did a few weeks of AO Year 1 for first grade before we went back to a more relaxed approach for the rest of the year. As he got older and we folded Emory into the mix, we continued to homeschool with a strong Charlotte Mason influence, but I was reading almost all of our living books aloud. When we transitioned back to AO and Elliott had to take on a lot more daily reading, I was worried that his "I hate reading" attitude would be a stumbling block for us. However, I am thrilled that he has risen to the challenge! He almost never complains about having to read multiple books a day or about the books in general! I think the rich quality of the books and the short lessons make it very doable. Although we studied Early American History last year, I didn't hesitate to have him cover part of it again, at a higher leveler and in much more depth. Year 4 also covers world history during this time frame, and we didn't have that broad of a focus last year, so I love that we're getting two streams of history. He was a little miffed about not starting This Country of Ours at the beginning, but he handled it well enough. He says it is boring, and some of his narrations reflect that attitude, while some of his narrations are fantastic! Year 4 also covers world history during this time frame, and we didn't have that broad of a focus last year, so I love that we're getting two streams of history. On a side note, at the beginning of Term 1, A Child's History of the World had I think one chapter scheduled. It felt completely random and out of place, but perhaps because we didn't come from Y3 and had no connection to the book or specific frame of reference. As for George Washington's World - the weekly reading schedule seems to be divided into five short sections. Since they are all short and topical readings, it makes sense to just do a short reading every day, but we do 4-day weeks so I try to combine two shorter readings, and make sure he's not doing a long literature reading that day. Just for fun, here's a little sneak peak of Battle Blitz, a game we're reviewing and using as a supplement. Instead of the recommended Benjamin Franklin biography for Term 1, I used Ben Franklin of Old Philadelphia. I already owned this particular book, because it was part of the previous program we were going to use. It's a quality living book in its own right, and could be divided perfectly into the term's allotted readings, so it made sense to use what I had so we could start immediately. (You may remember, we made the switch drastically and suddenly, and I was mostly using e-books otherwise until I could order the physical books.) I had him do a few written narrations from this book, but his oral narrations for this book were usually some of the best for the week. He may have been a little Franklin'd out after he started showing up in his other history and science readings second term, but he didn't voice actual displeasure. We're reading the Abigail Adams biography now. He's read a few chapters on his own, and I've read a few to him at his request. He doesn't love it, mostly tolerates it. The book is dense though, so it's probably better that I do read it with him so I can measure when to stop and narrate. I am enjoying the book, so I hope my enthusiasm rubs off a little. I decided to let him work on Y2 Geography with Emory, as they had initially asked to stay together for some subjects. Elliott would have been using a Holling book for geography anyway, and I already had all the Beautiful Feet Books maps, so I figured this would be a good subject to combine. This way, he will get at least two Holling books, and I only have to facilitate mapping for one book at a time. I am loosely combining the AO and BFB reading schedules. His maps may not be the neatest, but he says geography is one of his favorite subjects! We've finished Tree in the Trail and have started Seabird. He also started map drills back up. It was one of our least favorite/most forgotten activities first term, until I remembered the AO recommendation for Seterra Geography. He really loves this option, and loves trying to beat his accuracy and time! It also helps to have another computer-based activity to break up his reading/writing subjects. He does well with Storybook of Science. Even though it's one of the easiest books, I do let him read along with the librivox recording, because I was wanting to ease him into so many readings per day/week when we first started. We often look up videos or pictures afterwards. He liked the Gregor Mendel biography and I did ask for a written narration for this one since it was just a picture book. Now in Term 2, we went with the option to use our own Issac Newton biography, instead of the scheduled option. We're using Issac Newton: The Scientist Who Changed Everything, because again, I already owned this book. I just altered the modifiable schedule to accommodate a reading schedule for this book. I typically receive great narrations out of this one. Because I had originally purchased it as part of Beautiful Feet Books History of Science, I already had the BFB guide and he has the option of matching up some of the experiments if he wishes, and we were doing this until we switched our geology books. Now that brings us to Madam How and Lady Why. I was reading this one to him, because it's not the type of book you just hand over. We made it through 15 weeks, then he asked to switch. We didn't find the book difficult; I think he was trying to like it. We were dealing with the outdated science - but the tone of the book and the ideology propagated was just too much. I also realized that when he got through the book, Emory would then be in Year 4 and I'd have to do it again. His request to replace this book was based on merit, so I decided to honor it. I realize Madame How and Lady Why represents more than you will find in any other book. However, I did some research and found Rocks, Rivers and the Changing Earth: A First Book about Geology by Herman and Nina Schneider. It seemed to receive positive reviews on AO's Book Substitution forum, and Sabbath Mood Homeschool uses it for their 7th-9th grade Geology. After receiving the book, I feel like the reading level is light for that range, but it's appropriate for upper elementary and can be read independently. He likes this book, and I am getting good narrations. He also loves the readings that have experiments/activities included. Cursive/Copywork - He does passages from books, verses from AWANA, and sometimes quotes by people he's studying. Written Narrations - We haven't made it up to weekly, mostly because I forget, but we are doing them more frequently. I usually have his written narration replace typing lessons and/or studied dictation for the day. Studied Dictation - We're using Spelling Wisdom, and I really like it. I knew I would never remember to pull passages from our literature, so this works really well for us. He's done some formal grammar in the past, so right now I'm just pulling relevant lessons out of the dictation occasionally. He is using CTCMath for his math lessons. This boy also went through an "I hate math" phase for a long time, which perplexed me, because he always started the year eager to begin his new curriculum and he never actually struggled with math. When we switched to CTC, attitudes changed drastically. I find it compatible with CM - the lessons are short, and it's mastery based. Reviews are now included, but they are separate lessons. The individual lessons/questions all focus on one topic. He is still using Xtra Math for math drills, to make sure the facts are down. Attitudes have improved dramatically in regards to math, and he usually chooses Math first most days - even this far into the year! Age of Fable - This had such a slow start, but we got into the actual stories, it got better. I reading this to him, because even though the readings are very short, he needs it in small doses. His response has been "If people were going to make up fake gods, why didn't they just make them perfect?" We've had some interesting conversations, and I saw how someone looks up photos after each reading, so we might start doing that! Robinson Crusoe - Don't call the CM police, but it appears we were using an abridged version, that had parts (most of his religious introspection?) removed. It doesn't appear, however, that what remains was really simplified, as the remaining text otherwise "matched." We still found it a stretching read, and he seemed to like the story. By the time Emory gets to Y4, I'll also have a Y1, so I'm thinking we'll switch to the podcast version that AO users seem to enjoy, and hopefully Elliott will listen in with us. These are other things that should be part of the Y4 schedule that we aren't doing yet, or aren't doing "exactly" as written. Bible - We are not using their reading schedule. Trial and Triumph - He will do the alternate church history schedule later. Foreign Language - We dabble in Spanish, but we aren't consistent. Latin - We just haven't made it that far. Plutarch - Hoping to start next year when he's officially in 6th grade. Co-Op - In addition to gym, he also has art and science. That helps with both art and hands-on science that sometimes gets missed at home. Handicrafts - We just finished up our ArtAchieve lessons (mostly drawing oriented) and we're going to be doing clay next. He also received an electronics kit for us to review, as I thought it would be a good handicraft related to robotics - which had been his request. He and I will be working through this. I have made more tweaks to Year 4 than I anticipated, but I hope the heart of AO is still there. I feel like the kids are starting to thrive on Charlotte Mason's methods, and I'm so happy to have really transitioned. I think if I had pre-read Madam How and Lady Why and really prepped this book, we could have worked through it better, but we switched rather suddenly to AO and just kind of jumped into all the books. It is definitely a book that requires parental involvement, and I felt like I needed to invest my time elsewhere at this point. We tried one Sloyd project and liked it! I should definitely try it again and work through the book.